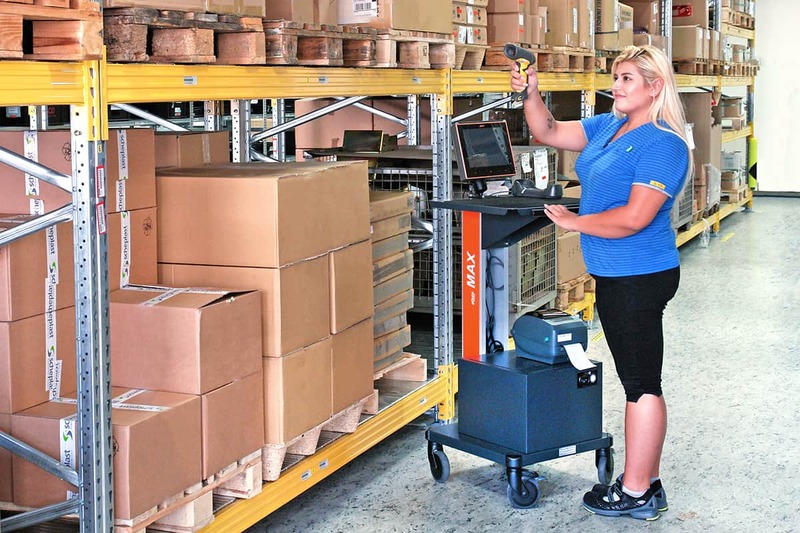 The busy warehouse environment with mechanical machines operating in the aisles alongside operatives on foot poses a considerable health and safety risk. Operatives who have to cross aisles to fetch printed documents and labels from a fixed IT station are particularly at risk, especially when under time pressure. This is where the MAX Mobile Workstation comes in to its own. MAX mobilises the IT resources and the busy operatives can have the printer at their finger tips removing the need to cross the aisles where there are machines at work. There is another significant benefit to be gained from investing in MAX, saving process time. Every time an operative has to walk the distance to and from a fixed IT station there are minutes lost that cannot be regained. Having all the resources immediately at hand increases work volumes and hence increases productivity. The old saying, “A stitch in time, saves nine” applies. In our competitive market seconds and minutes saved all add up and when amortised across the whole shift the return on investment in MAX will be quickly realised. A safe working environment and an efficient working environment benefits staff and management equally.